"More than anything else in the world, I wanted to be a writer. I didn't want to learn to write, of course. I just wanted to be a writer, and I often pictured myself poised at the foggy edge of a cliff somewhere in the south of France, wearing a cape, drawing furiously on a long cigarette, hollow-cheeked and haunted." The author of ten novels, three short story collections, a novella, Smith has received eight major writing awards, including the Lila Wallace/Readers Digest Award (1995-1997), the Robert Penn Warren Prize for Fiction (1991), and two O. Henry Awards (1979 and 1981). 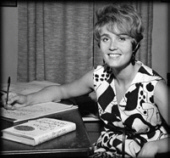 The list of honors, awards, and grants documenting her literary achievements goes on . . . Academy Award in Fiction from the American Academy of Arts & Letters (1999), Weatherford Award for Appalachian Literature (1988), North Carolina Award for Literature (1984), Sir Walter Raleigh Award for two of her books (1983 and 1989) and the Lyndhurst Grant (1990-1992). Numerous periodicals and anthologies have published her articles and stories -- Southern Review, Redbook, The New York Times, and Atlantic, to name a few. It takes only a glance at the titles of her books to determine the interest she has in Southern Literature and the contributions she has made toward preserving what is rapidly becoming a vanishing lifestyle: The Last Day the Dogbushes Bloomed, Harper and Row, 1968; Something in the Wind, Harper and Row, 1971; Fancy Strut, Harper and Row, 1973; Black Mountain Breakdown, Putnams, 1981; Cakewalk, Putnams, 1981 (stories); Oral History, Putnams, 1983; Family Linen, Putnams, 1985; Fair and Tender Ladies, Putnams, 1988; Me and My Baby View the Eclipse, Putnams, 1990 (stories); The Devil's Dream, Putnams, 1992; Saving Grace, 1995; The Christmas Letters, Algonquin Books of Chapel Hill, 1996 (novella); and News of the Spirit, Putnams, 1997 (stories). Although ties to the place of her birth are strongly represented in her work, they are only one indication of this author's creative output. Her professional and teaching experience as Professor of English at North Carolina State University and as a Fellow at the Center for Documentary Studies at Duke University has allowed her to share more than the unique and universal characters and plots her novels and stories offer. With a warmth and grace Southerners are often noted for, Lee Smith shares her craft and the skills she has developed with other writers, involving herself in workshops and writer's conferences and encouraging adults and students alike to take the risks involved in writing and to open themselves to the world around them. The fiction written by this Appalachian author has been called "a redemptive work of art" (The Washington Post Book World's review of her novel, Saving Grace). As she published book after book her critics agreed on the importance of her voice. One of her reviewers, writing about News of the Spirit, states in the Memphis Commercial Appeal that Smith's most compelling characteristic is "to light the page with the violence and vehemence of human emotion and to express those qualities in prose of crystalline purity and clarity." In the San Francisco Chronicle, one of her short story collections, Me and My Baby View the Eclipse, garnered praise with the reviewer's insistence that " . . . her craft is so strong, it becomes transparent, and like the best of storytellers, she knows how to get out of the way so the story can tell itself." Even earlier, by almost two decades, her stories were recognized, in a review of Cakewalk published in The Houston Post, as provoking an " . . . unalloyed delight, in the rich bourbon-flavored Southern tradition. Lee Smith often strikes dead center the nerves of women's lives, and does it with a grace and style that makes her one of the writers to watch most closely." Her extraordinary career has spanned more than three decades and, though she recently retired from her teaching post at North Carolina State University, Smith shows no signs of slowing down. Rather, she began her retirement by leading a new generation of writers through the development of a project published in November, 2000, by Tryon Press of Chapel Hill. In an effort to preserve the oral history of her own stomping ground in Grundy, Virginia, she edited a book made up of interviews with the town's older residents, collected by high school students there. A sense of urgency filled this undertaking since the work had to be completed before the implementation of a flood control plan scheduled to devastate the downtown area. When did you start writing, and what led you to this creative pursuit? All I ever wanted to do was write. I was an only child and, even when I was very little, my voracious appetite for reading led to this desire. I hated for my favorite books to end, so I would continue their stories by writing more onto the ends. Did any other writer serve as a mentor to you? Louis D. Rubin was my teacher and mentor. He started a creative writing program at Hollin's College in Roanoke, Virginia, where I was a student. That was in the early 60's when few such programs existed. Later, he helped to found Algonquin Books. Now he lives in Chapel Hill, North Carolina, and through the years he has been a good friend. How do you balance the demands of work and family? Not well -- at every age it's hard to do. When my children were little and when I started teaching, which was my full-time day job for years, I felt guilty for taking this kind of time for myself, like writing was my "secret vice." I retired from teaching after eighteen years at North Carolina State University. Before that I held other college-level teaching positions, including at Duke University. Out of all your creative ideas, how do you decide which projects to develop? It's true that I often have a lot of ideas in mind. Usually, one will seem most necessary at any given point. Sometimes deadlines or outside factors dictate the time frame. For example, I worked with a group of high school students in my home town to preserve the oral history of some of the older residents. The town, which often floods due to poor mine shaft management, is scheduled to be permanently flooded. The people who live there are moving to higher ground. The deadline had to be met even though I was in the middle of a novel and working on several short stories. When you begin a new project, which usually comes to you first . . . plot or character? Sometimes I work on ideas for years, so that by the time I start writing, I know the whole thing. I would say that the characters come first. What was the biggest obstacle you faced in publishing your books? I had sort of a strange publishing experience, so it wasn't really hard at first the way it is for most writers. I wrote a novel as a senior in college for an independent study--for credit. I was twenty-two years old, and the whole thing seemed deceptively easy. Then I wrote a bad second novel and a third one which was published by Harper & Row. While these gathered some nice reviews, they made no money for the publishers. At that time publishing was undergoing a change. Decisions began to be dictated by financial reasons. When I wrote my fourth novel, Black Mountain Breakdown, it was a dark and depressing story. The publishers said they had already lost money on my work, so they did not want this manuscript. I lost my agent and went for about eight years without publishing anything other than a short story or two (which kept me going). That's a long time for a writer. During this period I decided to rethink the whole thing. Black Mountain Breakdown had been a book I wanted to write, but people were scared of themes like women's passivity and characters who were all too willing to let other people determine what they are going to do. I thought I had been self-indulgent in taking the kind of time from my family that it takes to write fiction. I decided to go back to school and get a degree in Special Education in order to make more money teaching. A sudden call from an agent changed these plans. One of my writer friends had read my manuscript and sent it to his agent who thought he could find a publisher for it. I think Black Mountain Breakdown was a turning point. As I wrote this book, I was confronting my own doubts. Since then, I've written other books with the same kind of themes, the kind it's often hard to explore any other way. How do you handle writing both short stories and novels? Sometimes I stop in the middle of writing a novel and write a story. Short stories seem to have a sense of urgency about them. Like lyric poems, they are more like brief moments of intensity and lend themselves to being written quickly, unlike a novel which has a more leisurely pace. Short stories seem like magic. Young writers often think they must write quickly or lose the magic, but older writers know they won't. They have learned they must rest the mind and imagination. If you could start your writing career over, what would you do differently, if anything? I think I would remind myself early that passion in writing is not enough. Having something worthy to say is really important. In college I would pay more attention to other subjects . . . history, science and sociology, for example. Rather than reading mostly novels, I would absorb everything around me. Do you think technology has influenced your work? If so, how? Even though I have a website, I'm not really that involved with the Internet. I have an assistant who helps with research and puts my final drafts on disc. Most publishers want the manuscript on disc. I think computers and the Internet can cause problems for writers. Being able to do too much too fast is not always an advantage. I do believe that access to so much information can be helpful for students and others when it comes to literary criticism. What advice would you give to today's young writers? Absorb as much as you can and finally understand that what you write must have an idea. Read fiction constantly, find the writers you like, and try to emulate them. What is it that makes southern writers unique? They have innate storytelling ability. Even though the South has changed enormously and is more like the rest of the country today southerners still retain a narrative ability. My mother can spin a story out of thin air about something as simple as a trip to the grocery store. So can my daughter. Everything translates to stories. We are not given to abstraction, and there is a kind of "speakerly" delight in the stories which are often told in first person. Southern writers have an ear for dialogue, but this narrative urge holds a secret flaw. We can't babble on without having an idea or something truly important to say. "The story has always served this function, I believe, from the beginning of time. In the telling of it we discover who we are, why we exist, what we should do. It brings order and delight. Its form is inherently pleasing, and deeply satisfying to us. Because it has a beginning, a middle, and an end, it gives a recognizable shape to the muddle and chaos of our lives." In her book, The Christ-Haunted Landscape: Faith and Doubt in Southern Fiction, Susan Ketchin quotes Lee Smith as saying writing is a sort of salvation experience. This author and professor at Duke University continues, "She does think of writing in this way, and many of the other authors I interviewed for the book did. Their work represents and reflects serious struggles with faith and doubt." Such issues resound throughout the body of Lee Smith's work. Along with exploring what it means to be a woman -- and particularly a Southern woman from Appalachia -- she manages to breathe life into a wealth of characters who are looking for the same answers, from within and without, that her readers are trying to find. Lee Smith wouldn't have it any other way. 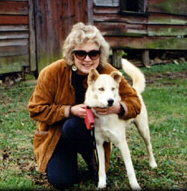 Janet Walker McDaniel is the author of By Train At Night, a collection of sixteen short stories (Henri Butler Press 2002), and a Georgia Author of the Year Award nominee. She works at the newspaper offices of The Cedartown Standard, leads two local writing groups and teaches computer literacy workshops.